During the winter, ice skating and sledding are permitted in selected parks from sunrise to sunset, following an open/close flag system. Important: Supervisors are not on duty at any of the ice rinks or sled hills. If you observe individuals on a pond when a red flag is flying or that does not have a flag system, please call 911 immediately. RED FLAG indicates weather conditions are unsafe. No skating is permitted. Ice must be at a specific thickness and condition in order to be safe for skating. YELLOW FLAG indicates skating is permitted but you must proceed with caution. Enjoy outdoor skating (weather permitting) at three parks where a flag system is used: South Ridge Park, Fabbrini Park, and Evergreen Parks. Follow the following flag system to ensure safety. 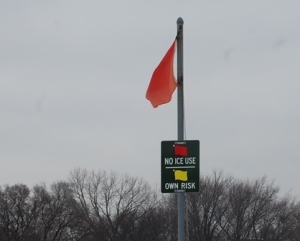 Ice skating is not permitted on lakes and ponds without a flag system or on lakes and ponds that are displaying a red flag. Ice must be a certain thickness before a yellow flag will be flown. Sometimes, despite cold temperatures, the ice does not freeze to the proper depth. please follow the flag system! If the weather isn’t suitable for outdoor skating, check our indoor Public Skate Schedule! Available at Pine Park and Seascape Family Aquatic Center (weather permitting). Please sled at your own risk, sled hills are not supervised.